The last verse of chapter 7 left us with God having to “wipe away all tears from [the] eyes” of the saints, who, in spite of being rescued from certain death at the end of the “great tribulation,” entertained no feelings of resentment against their enemies, and must have been saddened when they had to witness their destruction after saying “to the mountains and rocks, Fall on us, and hide us from the face of him that sitteth on the throne, and from the wrath of the Lamb” (Revelation 6:16). Although a thousand had fallen at their side and ten thousand at their right hand, and it had not touched them (Psalms 91:7 paraphrased), they felt no joy in witnessing that scene even though “it shall be said in that day, Lo, this is our God; we have waited for him, and he will save us: this is the LORD; we have waited for him, we will be glad and rejoice in his salvation” (Isaiah 25:9). Neither did the “Lamb,” in spite of the things He has to do, takes “no pleasure in the death of the wicked” (Ezekiel 33:11). 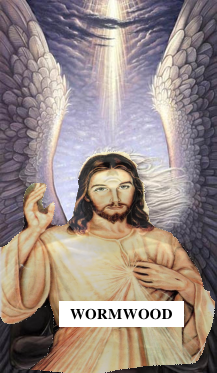 Having instructed His angels to “hurt not the earth . . . till we have sealed the servants of our God . . . “ (Revelation 7:3) represents His reluctance to carry out the concluding scenes of the great controversy that were prepared only “for the devil and his angels” (Matthew 25:41). At that point in the scenario of the “sixth seal,” beginning in current history from 1755, then to the second coming with the picture of those who will not stand but seek refuge from the wrath of the Lamb, John had reverted back in time asking: “who shall be able to stand?” (Revelation 6:17). The answer is given in chapter 7 where the 144,000 and the “great multitude” find themselves led “unto living fountains of waters,” after coming “out of [the] great tribulation” because they had “washed their robes, and made them white in the blood of the Lamb” (Revelation 7:14). But now, John takes us backward in the sequence of that last day scenario prior to the saints reward in heaven and just before the “four winds of the earth” had been released by the four angels. They had been protecting the earth, sea and trees from four wind’s destructive effects before the saints had been “sealed” with “the seal of the living God” (Revelation 7:1-9). This “silence” is in sharp contrast to the “loud voice” of the “great multitude” crying “Salvation to our God which sitteth upon the throne” in Revelation 7:10. Therefore, this scene, which is also “in heaven,” must precede that noisy scene. Many believe the “silence” is due to heaven being emptied of its inhabitants after they have “left the celestial courts to accompany Christ to the earth.”  Consequently, the “half . . . hour” would be assumed to represent “about one literal week”  of prophetic (day for a year) time. Since “hemiorion” is not found anywhere else in the Bible, we are left with no alternative other than to accept the literal translation: “approximately  . 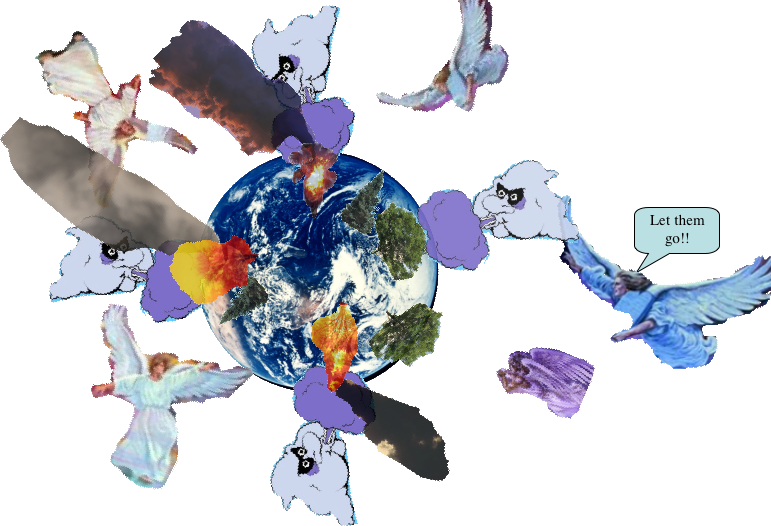 . . thirty minutes.” Such a brief period of time is much too short for anything other than a collective “holding of the breath” by all the heavenly onlookers; for, they are closely watching the successive events taking place on earth during the end-time scenario of the last seal. Expectation of what? 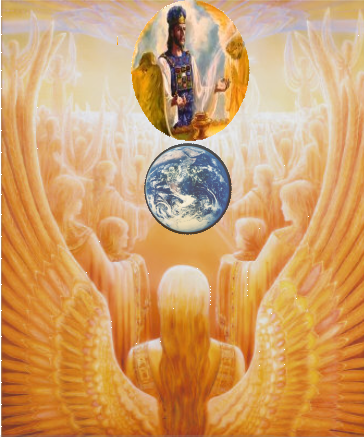 Even though humans may be largely unaware, even uncaring, the angels are very aware of what is about to happen. It will be something that has never transpired since sin entered the world. The Commentary refers to Early Writings pages 15, 16 and Desire of Ages page 693 to explain the “silence in heaven.”  There (in Early Writings) we find a “silence” on earth at the time of the second coming, but not in heaven. The Desire of the Ages reference is a time of “silence in heaven [when] no harp was touched [and] in silent grief [the angels] watched the Father separating His beams of light, love and glory from His beloved son . . .” when He was in the garden of Gethsemane two thousand years ago. So, neither of those references fulfill all the specifications of this thirty minute period of silence in heaven although the last comes closer. This silence comes when the “seventh seal” is opened and after the 144,000 and the “great multitude” have been “sealed “in their foreheads” after the “sixth seal” was opened. Nevertheless, explaining this to be “a silence of awesome expectation” is harmonious with the context, and makes good sense. Therefore, instead of concluding “ . . . all the heavenly harpers leave the courts above to come to this earth. . .”  during that half hour, it will be a brief moment before “all the angels stood round about the throne, and about the elders and the four beasts, and fell before the throne on their faces, and worshipped God, Saying, Amen: Blessing, and glory, and wisdom, and thanksgiving, and honour, and power, and might, be unto our God for ever and ever” (Revelation 7:11, 12) celebrating the victory of the “great multitude” as they “cried . . . Salvation to our God . . . and unto the Lamb” (Revelation 7:10). It will be easy to get confused later on if it is not recognized that there are two “seven angels” groups in the book of Revelation. These seven trumpet bearing angels are not the same as the “seven angels” who have “the seven last plagues” to whom were given “seven golden vials full of the wrath of God . . .” (Revelation 15:1, 6, 7. 8; 16:1; 17:1 and 21:9). Also, as this picture shows, these “seven [trumpet bearing] angels” do not sound their instruments right away. They not only wait for Jesus to do something else before they begin to blow, but must also sound them sequentially, one after the other rather than simultaneously. Consider also that this sounding takes place after the seventh seal is opened because there is no evidence whatsoever that they recapitulate the scenarios the preceding seals or even the seven churches. Later on, we will discover that the “seven” vial bearing angels will not begin to “pour” out their “vials” until after the “seventh” trumpet bearing angel has sounded. Here He “came and stood at the altar.” The last time He “came,” was when He had left the holy place in the heavenly sanctuary to take “the book out of the right hand of him that sat upon the throne” (Revelation 5:7) in the most holy place. Now, it appears He has left the most holy place to stand in front of the “altar” of incense in the holy place! (Exodus 30:1,6). The apostle Paul’s description of the earthly sanctuary is helpful here. Note that “after the second veil . . . called the Holiest of all” is found “the golden censer,  and the ark of the covenant. . .” He doesn’t say just where the censer was in relation to the ark, but we can assume it was placed, by the high priest, on top of the ark between the “cherubims of glory  shadowing the mercyseat. . .” (Hebrews 9:3-5) in the second apartment. 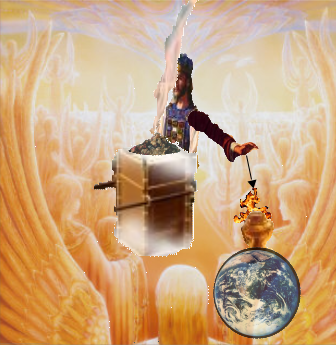 Now, Jesus has picked up the “golden censer,” that He must have carried with Him in into the most holy place in Revelation 5:7, and carries it with Him back into the holy place and stands “at the . . . golden altar which was before the throne” represented by the “table of shewbread” (Hebrews 9:2, Exodus 25:23, 30). Notice that the “incense” is mingled with “the prayers of all saints” without which, their prayers would be useless. Note also that that Jesus places the “incense . . . upon the golden altar,” not in the “golden censer,” an extremely important item to remember as we continue studying this breathtaking scenario. Verse 4: And the smoke of the incense, which came with the prayers of the saints, ascended up before God out of the angel’s hand. According to verse 3, the “incense” was offered “with the prayers of all saints upon the golden altar.” Here we see “the smoke of the incense” ascending “up . . . out of the angel’s hand” which seems odd. A possible solution could be found in the Greek word for “out of” which is “ek” or “ex.”  It could be translated “away from,” or “by.” If “by” is allowed, it could be understood as: “the smoke ascended up from the altar” by the hand of, or through the instrumentality of the angel. 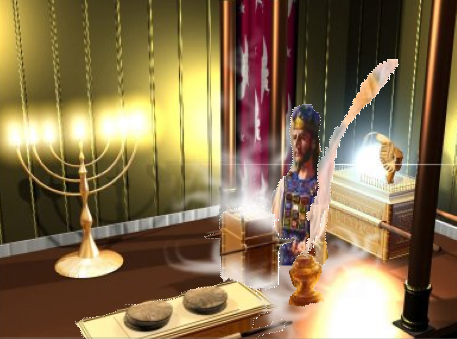 Therefore, we can conclude that the “smoke of the incense” came up from the incense on the “altar” where Jesus placed it as depicted in verse 3. This picture might be helpful in understanding that important point. It is important, not only because it give us the proper perspective for understanding what takes place in the next verse, but because the incense being representative of God’s sustaining grace, is full of comfort and assurance for the saints as they face the prospect of a time of trouble during which there will be no mediator in the heavenly sanctuary. In verse 3, He had the “golden censer.” Here He takes it. Knowing that the sequence of events and actions do not always follow exactly like the western mind perceives, it is possible He “took the censer” from the most holy place before He “came and stood at the altar” in the holy place. Consequently, this “incense” represents the mercy of God. The “fire,” on the other hand, symbolizes His justice. Therefore, when that angel cast the censer “into the earth,” the absence of incense in the censer signifies the absence of atonement! But remember, “the smoke of the incense, which came with the prayers of the saints,” is still ascending “up before God” from “the golden altar” where the incense was originally placed according to verse 3. That should bring great encouragement as we face the future. Without His sustaining grace, the saints could not stand for one moment, let alone the “half an hour” depicted in verse 1! 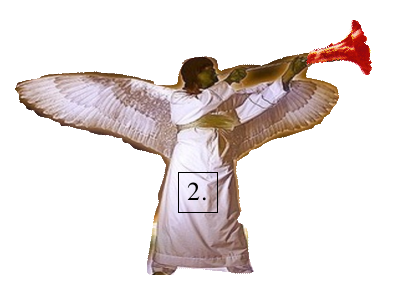 Therefore, a close unbreakable linkage is seen between the brief “silence in heaven” in verse 1, the seven angels reception of their trumpets in verse 2 but maintaining their silence while Jesus leaves the most holy place in verse 3, taking the incense out of the censer and placing it on the altar, filling the censer with fire, casting it “into the earth” and only then do the “seven angels” make preparation to sound them. While many rightly hold that the “seven churches . . . unfolds the religious history of the Christian era,” it is clear that the seven trumpets do not depict “the military history of the Christian era as it affects Christ’s church”  which many believe. Such understanding, although long held, is unsupportable because it separates the trumpets, depicted in verses 2 and 6 from their natural context depicted in verses 3 to 5 portraying Jesus coming out of the most holy place and entering the holy place of the heavenly sanctuary to conclude His ministry in the heavenly sanctuary. Note again, even though these seven angels receive their trumpets in verse 2, they are not sounded until Jesus completes the activity described in verses 3 to 5. The traditional belief runs roughshod over the clear evidence that the trumpets succeed the close of probation. They cannot be pushed back into history without doing violence to these passages. May God help us to see the importance of this and be willing to abandon anything that cannot be supported by scripture. Clearly, it is the piercing sound of this first trumpet that shatters the “silence” depicted in verse 1, while the praise service in ch.7:11,12, probably takes place a little later although we are not told when. According to the Commentary (looking at this trumpet from the historic perspective which considers it to be parallel to the first church of chapter 2), what is shown here is “descriptive of the invasion of the Roman Empire by the Visigoths under Alaric.” But, that took place “in A.D. 410”  long after the first period of the Christian era which is generally recognized to end about the year 100 A.D. So, even from the historic perspective, the dates don’t coincide. Refer back to the first verses of chapter 7 where “four angels” are seen “standing on the four corners of the earth” protecting “the earth . . . sea” and “trees” until God’s “servants” have been sealed in their foreheads.”  Here, “the earth” and the “trees” are “hurt” suggesting not only that “the four winds” have been released, but that “the servants of our God” have been “sealed in their foreheads” making it impossible to prove from scripture that the trumpet scenarios belong to history. “’Why are you praising the Lord?’ inquired those upon whom was coming sudden destruction. The “sudden destruction” that “was coming” to the inquirers and the belief that they “are lost” suggests this to be a postprobationary scenario. Also, that the “ball of fire [that] crushed large houses” portrays what is familiar to us during present, premillennial time. Additionally, the bitter complaint against those who were expecting those things, and who could have warned them about the prospect of that fiery ordeal, confirms they were all alive during probationary time. Evidently, those who were “praising the Lord” understood the future application of the trumpet scenario. They are not condemned for misapplying the trumpets, but for neglecting to share their understanding to whomever would listen. 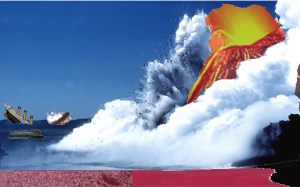 Verses 8, 9: And the second angel sounded, and as it were a great mountain burning with fire was cast into the sea: and the third part of the sea became blood; And the third part of the creatures which were in the sea, and had life, died; and the third part of the ships were destroyed. Here, John saw “as it were  a great mountain . . .” suggesting the “mountain” to be figurative, not literal. Although the Commentary declares this to be metaphoric of the Vandal’s invasion of Rome in A.D. 455, it also draws attention to “Jeremiah 51:25, where the prophet describes Babylon as a ‘destroying mountain’ that will be made a ‘burnt mountain.’”  In that case, this “mountain” is a metaphor for “Babylon,” not an erupting volcano. But, ancient Babylon was not destroyed by fire, neither was it “cast into the sea.” In fact many archeological artifacts of that city remain intact to this day. But, mystical Babylon, that the angel of Revelation 14:8 declares to be “fallen,” is a metaphor for all the fallen churches of the world. Its doom will come during the postmillennial time of “fire and brimstone” (Revelation 14:8-11; 20:9, 10, 14, 15) while the second trumpet is a premillennial catastrophe. But, there is a premillennial fiery disaster spoken of in Daniel 7:11, 12 which comes to “the horn” power after it became “the beast.” Daniel says: “I beheld . . . his body destroyed, and given to the burning flame.” That conflagration is clearly premillennial because the “lives” of “the rest of the beasts” “were prolonged for a season and time” after the preceding beast was destroyed by “fire,” whereas all are destroyed in the postmillennial lake of fire depicted in Revelation 20:14, 15. A premillennial “fire” is also spoken of in Revelation 19:20, 21 where “the beast was taken, and . . . cast alive into a lake of fire burning with brimstone, and the remnant were slain with the sword . . .” without being burned. That “beast” is represented in Revelation 17 as a corrupt woman whose name was “BABYLON THE GREAT.” She is hated by “ten kings” that “make her desolate, and naked, and shall eat her flesh, and burn her with fire” (Revelation 17:3, 5, 12, 16). Those who are not burned in that fire, “stand afar off” lamenting for “the smoke of her burning” (Revelation 18:9, 10, 15, 17, 18). Therefore, on the basis of this evidence, we can at least conclude this “great mountain burning with fire,” to be representative of “BABYLON THE GREAT” who will come to her doom during the postprobationary, premillennial time of the second trumpet. But, there is still more to understand. That cataclysm contaminates the “sea” to such an extent that “the third part of the sea became blood; and the third part of the creatures which were in the sea . . . died; and the third part  of the ships were destroyed”! That must account for the bitter grief expressed by “every shipmaster, and all the company in ships, and sailors, and as many as trade by sea [who] stood afar off, and cried when they saw the smoke of her burning . . .” (Revelation 18:17, 18). Verses 10, 11: And the third angel sounded, and there fell a great star from heaven, burning as it were a lamp, and it fell upon the third part of the rivers, and upon the fountains of waters; And the name of the star is called Wormwood: and the third part of the waters became wormwood; and many men died of the waters, because they were made bitter. As much as we would like to agree with the Commentary that suggests this to be a portrayal of “the invasion and ravages of the Huns under the leadership of their king Attila . 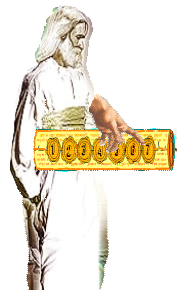 . . about 372 A.D. . . ,”  it should now be clear to us that it is scripturally impossible to consistently post this event to history, as the preterist would conclude. Remember, none of the trumpets are sounded until “the servants of our God” had been “sealed . 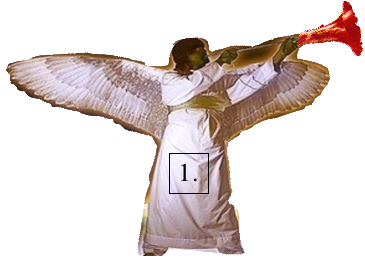 . . in their foreheads” before the “four winds of the earth” had been released and “the angel took the censer . . . filled it with fire . . . and cast it into the earth” (Revelation 7:2, 3; 8:5). We can be certain this is the case because, by this time “the earth, sea and trees” have been terribly “hurt” by the “hail and fire mingled with blood” and the “great mountain burning with fire” was “cast into the sea,” a third of which “became blood.” As bad as things have been on the earth in recent history, no event has even come close to the horrendous devastation caused by the first two trumpet scenarios. Likewise, anybody who thinks he/she, or anybody else is one of the 144,000 sealed saints is under serious delusion. Don’t forget: “the image of the beast is the test the people of God must have before they are sealed.”  The “image test”  has not yet happened although it should be clear to anyone familiar with prophecy that it is coming soon. So, if this trumpet is also descriptive of a future event, what is the nature of this “great star” that “fell . . . from heaven?” With a “third part” being a portion of this scenario as in the first and second trumpets, we have reason to believe it to be another demonstration of Satan’s demonic power. 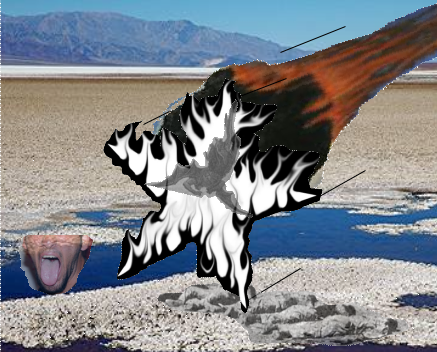 Some dissatisfied with the historic viewpoint, have interpreted the “star” to be something inanimate, such as a meteor. 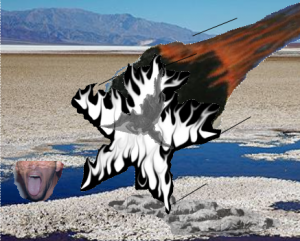 But, the destruction caused by a meteor of sufficient size to affect a “third of part of the rivers” and “fountains of waters” would be far more devastating then merely causing water to become bitter. Note that the “star” is given a proper name: “Wormwood” suggesting it to be animate. There are some instances in the Bible where “persons” or images are called a “star.” Christ Himself is depicted as “a Star out of Jacob,” and “the bright and morning star (Numbers 24:17; Revelation 22:16). “Moloch, Chiun” and “Remphan” are names given heathen images, and called “the star of your god.” (Amos 5:26; Acts 7:43). Basically, then, we are left with two options: this “star” represents Christ, or Satan. Why would Satan be named “Wormwood?”  The Commentary suggests it to be the name of “a notoriously bitter herb, Artemisia absinthium.”  It is not difficult to associate its bitterness with the experience of anyone who falls for Satan’s (as this “star”) lies. But, since this is a postprobationary, premillennial event, his coming down “from heaven, burning as it were a lamp,” suggests some kind of spectacular, mind boggling deception practiced on the world that he has never before been allowed to perform. But, say some: “Satan’s personation of Christ must come before the close of probation, not afterwards. After all, what would Satan have to gain after the saints have been sealed?” That conclusion is only an assumption with no support from scripture or the Spirit of Prophecy. Furthermore, it could even be a dangerous assumption. Consider that the chapter title in the book Great Controversy from which the above statement was selected is: “The Time of Trouble.” As we read from page 613 to 624, it becomes readily apparent that Mrs. White is writing of the postprobationary time of Jacob’s trouble. Note, she begins the chapter by quoting Daniel 12:1 when “Michael [shall] stand up” signifying the close of probation. But, such a condition could not be expected to discourage Satan’s effort to cause their fall. Consider the fact that even after reflecting on his past for a “thousand years” Satan will still “go out to deceive the nations” once more (Revelation 20:2, 8). But, during pre millennial time, he will have much more to gain after the close of probation if he is successful in causing the fall of even one of the saints that had been sealed with “the seal of the living God,” he would become the winner in the great controversy between himself and Christ and all would be lost! So, we can be certain that Satan will not relax his efforts in the least even after the close of probation. In fact Satan, if he really knew that probation was closed, would be expected to redouble his efforts to cause their fall. Even though martyrdom will no longer take place after the close of probation,  Satan will be intensely busy putting as much pressure on them as he did Jesus while He walked upon earth some 2,000 years ago. He has much more to gain after the close of probation than before! What about the “waters” that “were made bitter?” Later on, an angel tells John that “the waters which thou sawest, where the whore sitteth, are peoples, and multitude, and nations, and tongues” (Revelation 17:15). But, since, “many men died of the waters, because they were made bitter” suggests they are not only toxic, but had been ingested, and in that case the “waters” seem to be literal. Another possibility is that the “waters” are figurative of Wormwood’s doctrine or philosophy which brings death to those who “drink” (figuratively). 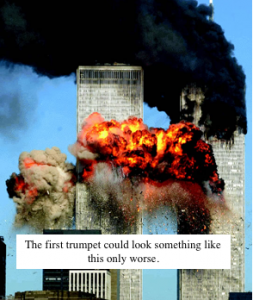 Although these trumpets are sounded sequentially, their effects are probably cumulative with the smoke of the first trumpet hanging in the air, then a third of the sea being bloody, a third of the ships sunk to the bottom, from the second trumpet, then Satan disguised as Christ claiming the loyalty of his deluded followers throughout the earth, in the third. This trumpet only adds to the confusion of a “time of trouble such as never was since there was a nation, even to that same time.” But, God’s people “shall be delivered, every one that shall be found written in the book” (Daniel 12:1) of life. While the Commentary, looking at these things from the historical perspective, suggests the “sun, moon, and stars” might be “interpreted to represent the great luminaries of the Western Roman government—its emperors, senators, and consuls” and “the extinction of Western Rome in A.D. 476,”  going back to verses 2 to 6 reminds us that the trumpets do not sound until Jesus casts the “censer . . . into the earth” (Revelation 8:5) signifying the close of probation. 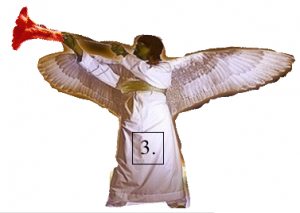 Therefore, the “fourth angel” has not yet sounded because Jesus has not yet thrown down the censer. We also need to remind ourselves, that the note sounded by this trumpet (as well as the previous three), warns of another element in Satan’s last day strategy to marshal the whole world under his command and ultimately, the total annihilation of God’s people. To begin with, the dissimilarity between this trumpet and the “fourth” plague is striking. When “the fourth angel poured out his vial upon the sun . . . power was given unto him to scorch men with fire. And men were scorched with great heat . . .” (Revelation 16:8,9). 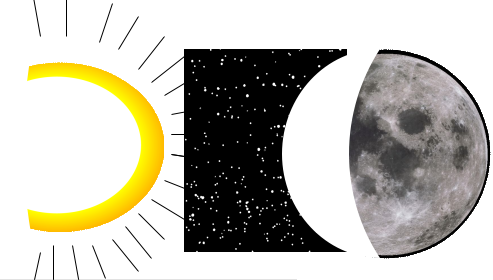 Instead, this trumpet diminishes or darkens, not only a “third part of the sun . . . moon . . . stars, but “a third part” of “the night likewise!” more evidence that the trumpets and plagues are separate and distinct events. What then, is the significance of the “third part of the sun . . . moon . . . stars” being “smitten” or “darkened” as well as the “day” and even the “night?” While the Commentary’s historic explanation makes sense, the Bible demands a future, end time explanation in terms of another Satanic delusion. In the third trumpet, of verses 10 and 11, it seems that “professing Christians (represented by the red horse of Revelation 6:4) will meet with bitter disappointment in the days of God” when they discover who “Wormwood” (the false Christ) really is. In the meantime, being fully persuaded by the “miracles which he had power to do” even to the point of making “fire come down from heaven on the earth in the sight of men” (Revelation 13:13), the avowed unbeliever, represented by the “pale horse” of Revelation 6:8, would probably consider “Wormwood” a fraud. But, Satan is not at all frustrated. He causes these “fearful sights of a supernatural character” displayed by the darkening of the “sun, moon, stars” the “day” and even the “night” that cannot be explained scientifically. Furthermore, since these signs are all astronomical possibly like a multiple eclipse except for the darkening of the day and night, they will certainly attract a lot of attention. Everybody will witness them. Hence, even the avowed unbeliever will be forced to recognize the “supernatural character” of these wonders. But, will they be forced to recognize Wormwood, the false Christ whom the professed Christian believe is responsible? But, before Satan can refocus the attention of his follower (represented by both the red and pale horses who sought to kill God’s people for refusing the “mark” but were distracted by the first three trumpet scenarios) he marshals the whole world under his disguises as either Wormwood or Abaddon. That sets the stage for the great conflict first mentioned by Daniel when “the king of the south [shall] push at [the king of the north] and the king of the north shall come against him like a whirlwind . . .” (Daniel 11:40). In other words, Satan will engineer a pitched battle between the followers of Abaddon (king of the south) and the followers of Wormwood (king of the north). Then, another “loud voice” cried “”Woe to the inhabiters of the earth . . . for the devil is come down unto you, having great wrath, because he knoweth that he hath but a short time.” (Revelation 12:10,12). In other words, the warning is being given right now, even as we read! But here, the warning is repeated three times as “Woe, woe, woe”  suggesting three different cataclysmic events that will bring utter disaster. Confirmation is found in Revelation 9:12 and 11:14 where “One woe is past; and, behold, there come two woes more hereafter” and the “second woe is past; and, behold, the third woe cometh quickly.” It is also clear that these woes are the final trumpet events with the first woe being the fifth trumpet, the second woe being the sixth trumpet and the third woe being the seventh trumpet. Therefore, the “fifth angel” is the first “woe,” the sixth angel” is the second “woe,” and the seventh angel is the third “woe.” Uriah Smith says the same thing about “the three remaining trumpets” . Keep this important point in mind because it will answer a lot of question that will arise later on. Just a word of warning. The next chapter contains many strange symbols that might be upsetting to sensitive souls including children. A word to the wise is sufficient. It might be well not to talk too freely about them within in hearing distance. Nevertheless, remember, these things were given John by the Lord Himself and neglecting to contemplate them really amounts to an insult to our Lord and Master. So, lets lay aside our reservations and march ahead. Summary of chapter 8: This chapter commences with the opening of the “seventh seal” and a brief moment of “silence in heaven.” Instead of disconnecting those features from the remainder of the chapter, as many commentators suggest, they are really introductory to scenario presented herein. During the moment of “silence,” Jesus leaves the most holy place in the heavenly sanctuary, takes the incense out of the censer, places it on the golden altar (representing his sustaining grace in behalf of the saints during post probationary time), fills the censer with fire of the altar and casts it into the earth signaling the close of his priestly ministry. The seven angels who were given seven trumpets during the moment of silence, then precede to sound them one after another with the events of the first four trumpets being depicted in this chapter. Afterwards, the earth, sea and trees that were being protected by the four angels in chapter 7, are seen to be “hurt” in the first two trumpet scenarios. Since the terrible power of Satan is represented by the “four winds of the earth,” it seems clear that the “hurt” befalling the earth, sea and trees in the first two trumpets, indicates that the “four winds” have been released, “the servants of our God” have been “sealed . . . in their foreheads,” and Satan is the responsible agent for those catastrophes. This is powerful evidence that the trumpets, including the three woes, represent future events. It is difficult for the western mind to follow John’s sequence in the sixth seal scenario. Seeing that the “sixth seal” of Revelation 6:12 covers the darkening of the sun and falling of stars in verses 12 and 13 then jumps forward to the second coming in verses 14 to 17 then back to the sealing in chapter 7:4-10 then forward again to the reward of the saints in verses 15 to 17 is confusing. But, if we are willing to recognize that the question in Revelation 6:17 “who shall be able to stand?” is the focus of the entire “sixth seal” scenario of Revelation 6:12 to 7:17, we should be able to see that John has answered that question very well with his own style of writing. Now, in chapter 8, he takes us back again to the opening of the seventh and last seal that he saw on “the book” of Revelation 5:1 that was “sealed with seven seals.” So, be prepared to follow what John is saying and expect that he will do some more sequential “jumping” forward and backward in the remaining, wonderful scenarios of the book of Revelation. Some believe, because of this juxta positioning that the seventh seal takes place even after the second coming! “about the space” is from “hace” (Strong’s #5613) “hos hoce probably from comparative from 3739;; adv. KJV – as 342, when 42, how 18, as it were 20, about 14, misc 56; 492. 1) as, like, even as, etc. see the comments in SDA Bible Commentary Vol.7, page 787 (left column under “Silence in heaven.) where references to the silence is depicted in Early Writings pages 15, 6 and Desire of Ages page 693. Consider this statement from Manuscript Releases Vol.15, page 219: “Thy right hand, O God, shall dash in pieces Thine enemies. Revelation 6 and 7 are full of meaning. Terrible are the judgments of God revealed. The seven angels stood before God to receive their commission. To them were given seven trumpets. The Lord was going forth to punish the inhabitants of the earth for their iniquity, and the earth was to disclose her blood and no more cover her slain. Give the description in chapter 6.” Note the underlined portion which quotes Revelation 8:2 with the context clearly moving it into the future. If the reader will take the time to look up the quote, they will find that both the succeeding and preceding paragraphs speak of the seven last plague scenario which is also future. Mervyn Maxwell in “God Cares” Vol.2 pages 228 & 229 says “the angel at the altar in [this] passage . . . seems not to be Jesus. Rather, he seems to be the angel of the altar and fire who is mentioned again in Revelation 14:18, which, in my view, is also Christ. 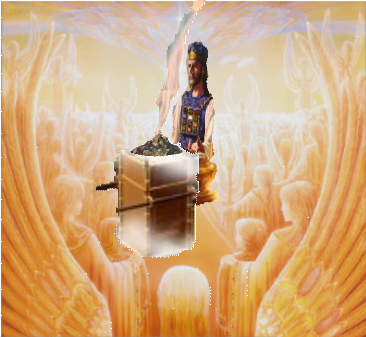 Although a “censer” is depicted in Lev.10:1; 16:12; Numbers 16:12, 17, 18, 46; 2 Chronicles 26;19 and Ezekiel 8:11, this is the only other place in the Bible that mentions a “golden censer.” Uncertainty exists over whether it is “a censer or the altar of incense.” (see the discussion in SDA Bible Commentary Vol.7, page 449) However, I prefer to take it just like Paul says because it coincides well with John’s words. Interestingly, there is a beautiful picture of Jesus standing before the ark with a golden censer sitting on the ark in front of Him on the page opposite to the above comment in 7BC 449. Mrs. White in Great Controversy page 411, who quotes Paul, makes no effort to explain it either. “out of” from “ek” or “ex” (Strong’s #1537) “It is a primary preposition denoting origin (literal or figurative; direct or remote).” Translated: “of” x 366; “from” x 181; “out of” x 162; “by” x 55; “on” x 34; “with” x 25; misc. x 98 total: 921. “pre millennial” = before the thousand years; “post probationary” = after the close of probation; “executive judgment” = when the sentence decided upon in the investigative judgment is carried out. the common understanding that the “silence in heaven” is suggestive of the second coming when heaven is emptied of its angelic inhabitants forces the understanding that verse 2 introduces “a new phase of the vision . . .” (for example, see Revelation of Jesus Christ by Ranko Stefanovic page 285) On the other hand, the SDA Bible Commentary suggests, among other possibilities, that: “since “the symbolization of v.5 points to the end of Christ’s intercession, the events that follow might logically be taken to represent judgments of God poured out on the earth after the close of probation.” (SDA Bible Commentary Vol.7, page 788 [left column under “seven trumpets.]) This is the viewpoint that I have adopted. The relationship of Revelation 8 to Revelation 7:1, 3 should be obvious without having to draw attention to it. But, the power of traditionally held belief is just as strong as it was in the days of Christ when he tried to warn the disciples of His coming death. The sounding of the trumpets in heaven is figurative rather than literal. In fact they are really sounding right now warning us of what is to come and to be prepared as the above statement suggests. When the events associated with the trumpets actually transpire, the warnings will be too late since Jesus will have already cast down the censer as we read in Revelation 8:5. This is the “test” that will take place when the “fifth seal” of Revelation 6:9-11 is opened. see Great Controversy pages 623, 624. Although Mrs. White says nothing about the avowed unbeliever in this passage, the concept seems to harmonize with what we find in the Bible. 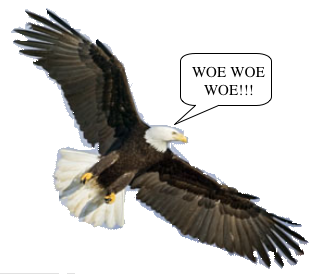 “woe” from: “ouai” (Strong’s #3759)” a primary exclamation of grief” in the “interjectory” sense.